Watch collecting has introduced me to some new and very special friends. And one of them sent me an email after I had commented about not buying a watch and waiting for one of his. He sent me a hilarious response and now, here, I finally have a place to publish this saved tidbit. If you have a good one, please it to me. I just may post it! Here is a Zodiac Orange and black Sea Wolf (serial # 2077347) hard at work on a Navy vessel. 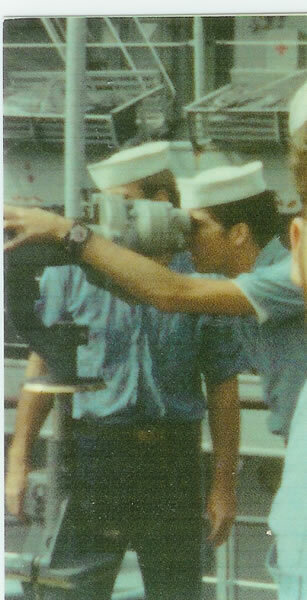 This young man is on board the USS Lloyd Thomas DD-764 during his tour in Viet Nam in 1970 - 1971. 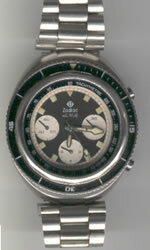 While I was unable to restore this watch for him, was nice enough to let me use these pictures on my web site. When I was in Alabama in '76 and I went hunting with some good ole boys. After a coupla hours we all gathered around this stump to jaw and drink coffee. Well, Jimmy-Boy says, "Hey Billy-Bob, how much yew want fur that 57 Chevy you got?" Now Billy-Bob figgers, who brings money hunting? So he decides to make a funny. He says, "$700. Cash right now." So Jimmy-Boy reaches in his pocket and pulls out a WAD of $100 bills and peels off 7 of them and throws them down on the stump. Billy-Bob merely reaches in his pocket, pulls his keys out and throws them on the stump and picks up them 7 $100 bills and puts them in his pocket. The only thing he said was, "Nice doing business with yew Jimmy-Boy." Now obviously this was a setup and every one was in on it except poor old Billy-Bob. But where I come from, you don't say one thing and do another. At least when there are 6 other guys standing around with guns. 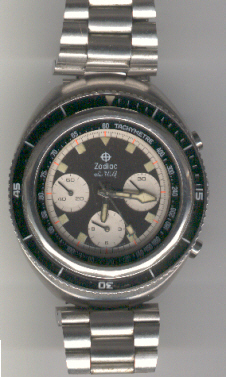 Considering your interest in Zodiac, I thought you might like to know the role my Zodiac GMT played in the NASA Apollo program. In the mid to late 60's my job was that of NASA Representative aboard the Apollo Tracking Ship "USNS Redstone". 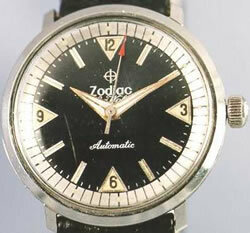 I originally purchased the Zodiac because I knew that I would be changing time zones on a daily basis, and the ship's clocks were kept at local time. I also needed to keep track of the time at my home office at the Goddard Space Center and at Mission Control in Houston. The Zodiac helped me do that using the GMT feature. The Redstone tracked most all of the early Apollo flights, first in the Atlantic, and later in the Pacific. For Apollo 11 (the first Lunar Landing), the Redstone Test Support Point was about 400 miles South South West of Tokyo, and we were surrounded by 4 Hurricane type of storms. Our role on that flight was that we were the primary tracking station for the Trans-Luner Injection booster firing, and we were the secondary tracking station for tracking the spacecraft reentry. My Zodiac GMT served me well. That doesn't make sense, you can't ever have too many watches....says he as he wonders how to prepare the spam and macaroni & cheese tonight, and what to feed the turtle, that has been looking hungry lately, and why is there no junk mail when I need it to patch the holes in the trailer when the wind goes whipping through at four in the morning making me shiver through my thin U-Haul quilt. Got lotsa watches, though. Maybe this Sea Wolf was the Seal "training" model, perhaps a part of one those military games where they are blind-folded, shoved in the water and after getting their hands out of the handcuffs they look to their trusty watch only to find that the government tricked them and left them to be late for chow. Meanwhile 33 years later one of these disgruntled vets has come out of hiding from the hills of South Dakota and dumped this watch off on this company in exchange for some supplies to see him through this Y2K thing.<<<<<< Well its just an idea Butch?! If you ever come across a Blue Zodiac Astrographic, like the one on your home page, I would very much like to talk you about purchasing it. I have just carried the memory of such a beautiful time piece in my mind since I viewed a similar one, in my youth. I remember it was on display at our local airport, behind a glass case, for approximately 1 year. (early 70's) There was a sign that stated it was not a working model, as an effort to discourage people from trying to remove it. Many design elements, of this piece, speak to me, and I have hopped to come across one like it for many years. Other watch manufactures have never come close to the total impact that this unit presents to me visually. So you can tell that I have no knowledge base for judging what a fair market price for it would be. I only know what I admire about it. Thank you for your time. Would like to purchase the Zodiac Sea Wolf with the orange dial inside the gray outer one..been looking for one like that for years...bought mine in Vietnam and lost it along the years. 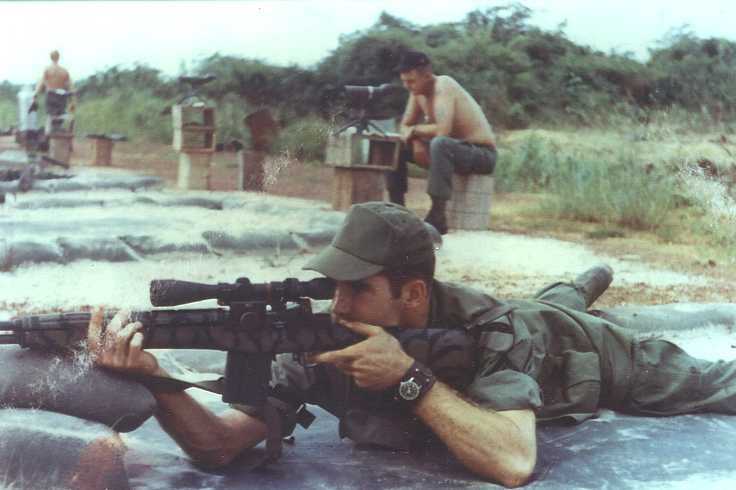 It's only the second one that I've seen, the one I had I bought for $39.00 in 1969 at the Air Base in Nha Trang, RVN, while we were getting repairs made on the O2b. I wonder if they were only sold overseas...the stereo I bought in Vietnam is a weird model also...they probably sent all the stuff that didn't sell over to Nam ...cause we'd buy anything we could..
Do you still have the two original NOS SS signed Zodiac crowns for the Seawolf? if so, please reserve one for me. I would like to bring my 1960 Seawolf "into compliance". It still works, keeps perfect time however; I now have and wear the new Zodiac Seawolf automatic, day/date two tone, dark blue bluepoint collection, purchased in 1995 as a wedding anniversary present from my wife, I now wear this one every day. I guess I am a Zodiactic! 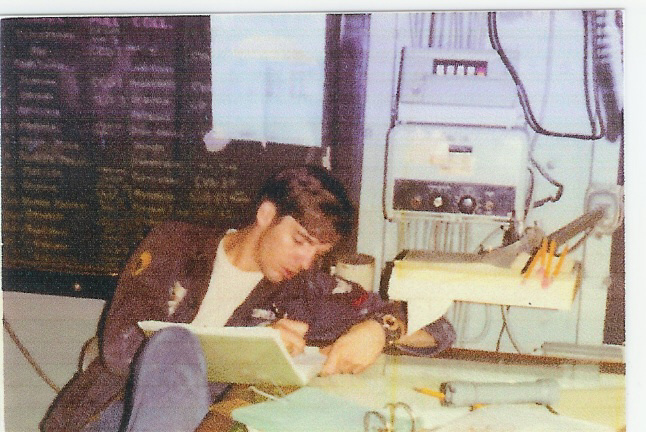 ......As a scuba diver in my tour of duty in the Air Force during the 1960 to 1964 time period, I fell for the watch for what it represented at that period, I purchased it at the base exchange at well under a hundred dollars at that time! I wore it everyday and it certainly lived up to that billing and more, as I did quite a few dives with it!! !, had it serviced a few times, it shows a little wear on the edges of the bezel and the luminous paint on the point mark there is gone, however, .......it still works .....keeps perfect time!.....but it is now housed in the jewelry box for safe keeping. I also have the original box but lost the inner mounting part to it.........Thought I would share my little story with you. Postal Money Order is in the snail-mail system for the Zodiac Astro that you are holding for me. Don't worry the children can wait until next week to have some food, but you will have your money for the watch. It's OK really, they are so cute, when they look at you with those big eyes, and say, "Daddy, we've been good, can we have some food now?" and I say, "No children, Mr Butch has to have his money, or Daddy will loose the watch, now eat your big bowl of Steam" They are such darlings. Maybe they will understand when they get older. It is hard to explain addictive behavior to such young minds. Just wanted you to know it is on the way. The gold square one that I picked up should be shipping out to me today from MA., so I will forward it to you with another check. Hope the kids are still alive by then, but if not, you'll understand. Here's one that you might list in your Watch Stories page. It is a true story. While working in a retail Golf equipment store, and wearing my 1980's Tudor chronograph, black dial with white registers, I got to talking with one of my customers, and told me he liked my watch. He then told me that he had one similar to it. I told him I was a casual collector and asked him if it was for sale. He said if I liked it, I could just have it. I know it sounds strange, but I think he liked my personality, we seemed to really connect. He gave me directions to his house, and after work I drove about 45 miles to get there. I didn't get my hopes up, but eventually arrived at his place. 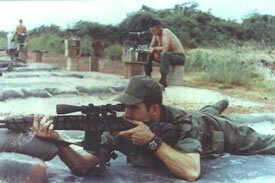 He told me that he was a Doctor, and in the early 1970s he was in the Navy Seals. He handed me a vintage Zodiac Super Sea Wolf massive three register chronograph, with rotating dive bezel, pressure proof to 20 ATM, equipped with its original signed stainless steel bracelet, and in perfect working order! He told me it was issued to him in September of 1972, and that it was mine if I wanted it. I told him I had to give him something for it, and forced him to accept $50 for it. I kept a "poker face" so he wouldn't change his mind, and when I left his house, I think I yelled out with excitement! Turns out that the watch has the coveted Valjoux 72 movement. I've had it for about 10 years now, and have turned down many offers to buy it at the shows I attend. It is one of my favorite pieces. I never saw him again.